Low interest rates and aggressive leasing programs have made some fairly expensive cars affordable. Rather than struggling to get approved for a new home loan or refinance, Americans have instead financed cars, where getting a loan approval has been easier. The abundance of attractive loans has helped elevate auto sales throughout the country over the past few years. 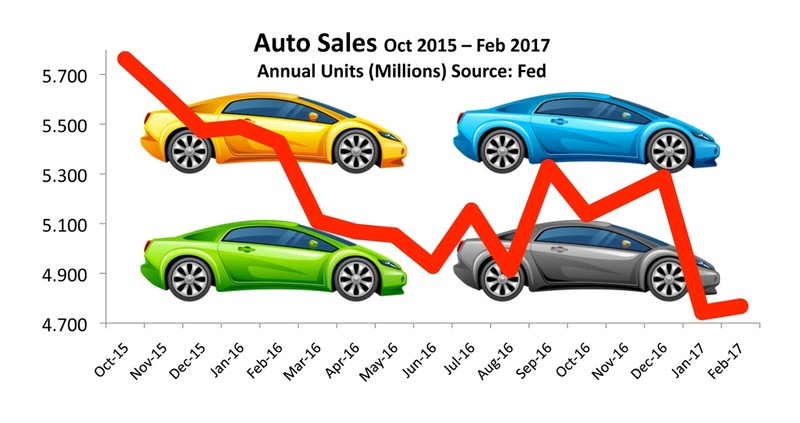 Recent auto sales have been slowing across the country as dealer incentives have become less effective. The end of 2016 saw auto loans outstanding reach $1.1 trillion, propelled by continued low interest rates. Federal Reserve data revealed that the average rate on a typical 4 year auto loan was 4.45% in the 4th quarter of 2016. The same auto loan in February 1982 was 17.05%. As expensive as some automobiles have become for consumers, an auto loan is the only method of actually affording the pricey cars of today. Over the years, several automobile companies have established their own financing thus allowing buyers to buy and borrow directly from them. A growing concern among analysts are the number of auto loans that have been securitized over the past few years. The ultra-low rate environment has created incredible affordability for consumers as well as attractive high yielding securities for risk seeking investors. An increase in rates may lead to an increase in auto loan defaults as payments become less affordable.